It's Handmade Monday , and this time from it's new home at Handmade Harbour where I'am sure it will be a great success. My second experiment involved trapping foil between two pieces of glass. 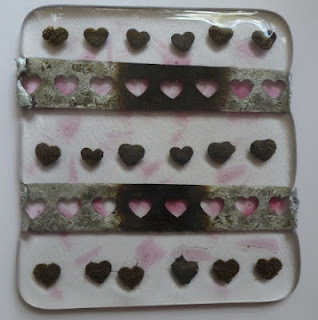 I had been reading a glass making book and when I got to the chapter on metal inclusions I thought 'ooo I'll give that a try' I took some kitchen aluminium foil and, using a heart shaped paper punch, made some small foil hearts. I was left with a strip with the heart holes in and decided to use this too. I added some pink glass confetti to add a bit of colour and into the kiln it went. Next morning, when I took a look, I was both pleased and disappointed with how it turned out. Disappointed because the strip of metal foil is still poking out of the glass, a daft mistake I should have avoided (but that's how I learn I'm going to tell myself!) and the confetti isn't very bright. But pleased because it worked! I wasn't sure the hearts would keep their shape, The are really small and I thought that they would end up like a weird blob.I also love how they have changed colour and some of them seem to have little bubbles all over them... I think this is an experiment I will be repeating! I hope everyone has had a great weekend. It's good to experiment and you never know what you will get. Great results! Lovely glass, I am dying to try some fused glass at some time. 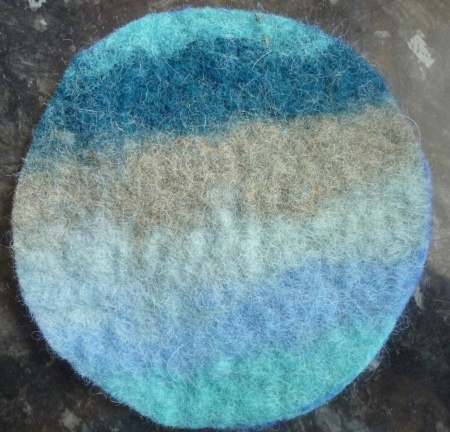 Made me chuckle too as I have a plan to try some wet felting this week and was going to do coasters too! Now these are the kind of experiments I like, always have a beautiful outcome. Well done. Hope you have a good week. Your felting looks great and as for the glass thats brilliant. I think you will go from strength to strength in both materials. I really like the little hearts going across good idea. I like what you've done with the glass. I've never tried metal inclusions. But in the fall I'm going to drag my kiln out and get started with it again. I have a busy summer, but I am dying to get back to glass making. Your little piece is actually very cool. Thank you for the ideas! very interesting experiments and attempts at combining two materials together, glass and metal - very unique! I love that first picture, it looks like the moon. Good luck on your experiments, I look forward to seeing your future results. I love the feltwork,it's lovely colours. I really like the idea of what you did with the glass,it looks like a paperweight.Love the metal in it. That glass is brilliant! Did you manage to trim the edges or is that not possible? Excuse my ignorance! I'm going to try a bit of resin when my kit (and instruction book!) arrives. Good luck with the glass and felt! How lovely to be playing with both felt and glass! I am very envious you have a kiln to do the glass work in, the glass looks so different, I didn't know you could put foil in!